The National Mississippi River Musuem & Aquarium, a property of the Dubuque County Historical Society, recognizes donors who have made a planned gift to the institution. To ensure the history, culture and life of the Mississippi River and rivers of America is preserved for future generations, we ask you to consider making a planned gift to the National Mississippi River Museum & Aquarium. You can support the Aquarium’s longevity while achieving your financial, philanthropic, and estate-planning goals. We will work with you and your professional advisor to create an appropriate gift plan that helps you leave your legacy. For more information about leaving a legacy, contact Erin Dragotto, VP of Development, at 563-557-9545 x210. 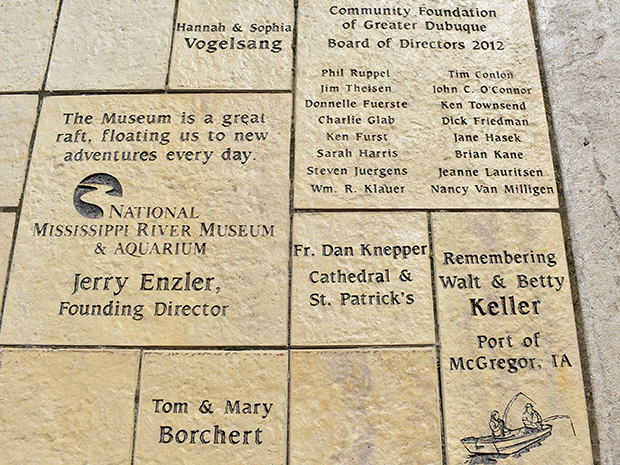 Become a partner with the National Mississippi River Museum & Aquarium and have a presence in the Port of Dubuque by purchasing a Mississippi Plaza Paver. Your personalized paver will make a meaningful gift to honor or memorialize someone's legacy. For more information about gifts in honor or memory of someone, contact Vicky Sutter, Development Manager, at 563-557-9545 x276.